Trains at the New Delhi railway station. Credit Saiko3p/ Shutterstock. Transport ministers for India and France have signed a Memorandum of Understanding (MoU) to strengthen their countries’ technical cooperation around railways. 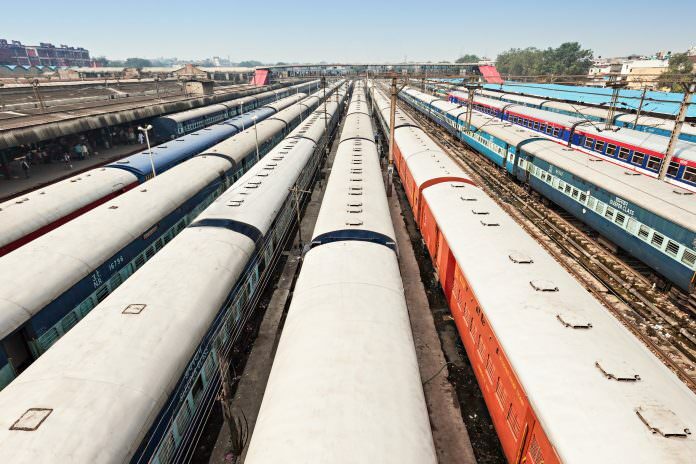 An initial agreement was established in 2013 with the signing of an MoU and, following a meeting on April 13, SNCF and Indian Railways have reaffirmed their intention to work together on a number of key issues. The relationship will focus on high-speed and semi high-speed rail; modernisation of current operations and infrastructure; station renovation and operations; suburban trains; and safety systems, operations and security. On semi-high speed rail, the two sides have decided to carry out a technical and execution study for upgrading the speed of passenger trains on the railway line between Delhi and Chandigarh for up to 200 km/h services. The study is likely to be completed by September 2017. The meeting was held between Indian Minister for Railways, Suresh Prabhakar Prabhu, and the Minister of State for Transport, Marine Affairs and Fisheries of the Republic of France, Alain Vidalies. India has more than 66,600km of railways and more than 7,000 stations whereas France has 30,000km of railways, 2,000km of high-speed rail infrastructure and close to 3,000 stations.